It’s pretty darn wonderful that there is practically a whole month dedicated to LOVE. Yes, there’s the official day of love — hello, Valentine’s! Of course there’s National Heart Health Month, too, which loosely translates into four weeks of “treating yourself right.” And in general, between blushing cheeks, neighborly kindness, and heart-shaped flare, the streets are pulsing with patience and random acts of sweetness. Which is just magical. And that brings me naturally to food. Food is one of the easiest ways to show your love for someone. Whether it is a small, sugar-filled treat or something hearty and savory, made with your blood, sweat, and happy tears. When you cook WITH love, food tastes better. When you cook WITH someone, food tastes great. And when you cook FOR others, well, that’s just more filling that a heart-shaped steak. So here’s a two recipes to make with love for those you love (even if that someone just happens to be YOU!). Because it’s all about keeping that body you love in tip top shape, so those hearts can keep pounding and fluttering for years to come. While this recipe is totally simple enough for just one person to make it on his or her own, this is also the PERFECT recipe to make with a kitchen partner-in-crime — whether it is a first day (flour fight! ), a tenth anniversary (flour fight! ), or a hang with Grandma (smooches!). 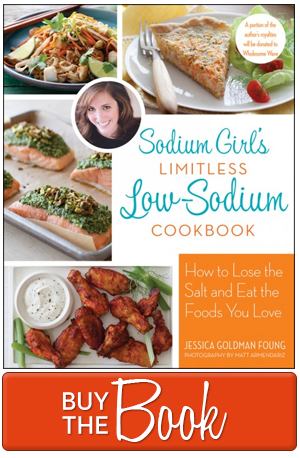 You can find the original version with cream in my latest book, LOW-SO GOOD. But I wanted to give you a little Valentine’s day treat, so you can find the yogurt-version here, below. And while this uses broccoli, I am almost positive you could replace it with some raw, red beet if you want to give it a red, holiday spin! PS: This gorgeous photo is by John Lee. Line a baking pan with parchment paper of dust lightly with flour. 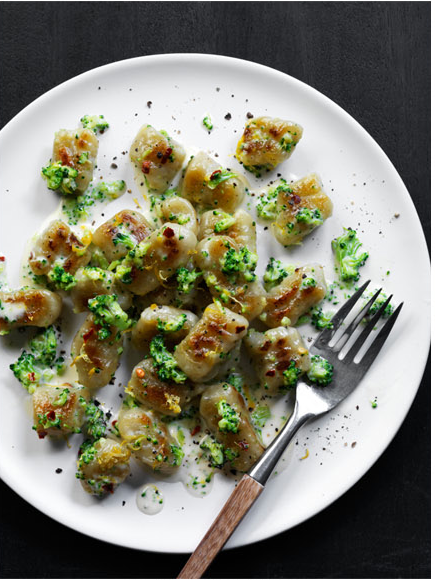 In a food processor (or blender), combine the broccoli stems, garlic black pepper, and the lemon juice. Puree until the broccoli mixture is smooth-ish, stopping to scrape down the bowl and adding 1 Tbsp water if needed to loosen. Transfer the puree to a medium bowl. Add the flour, 1/4 cup at a time, stirring until well combined after each addition. When ready, the dough will feel neither too sticky nor too flaky, just soft and pliable. With floured hands, shape the dough into a ball. On a lightly floured work surface, cut the dough ball into four even sections. Working with one section at a time, roll out the dough into a long rope about 1/2-inch thick. Use a knife to cut the dough rope into 1/2-inch pieces. Place the times of a fork on top of each dough piece, one at a time, and pull the fork toward you, gently rolling the gnoccho onto itself, making little grooves. Place finished gnocchi in the prepared baking pan. (At this point you can dust the gnocchi with flour and put in the freezer. When they harden, transfer to a resealable plastic bags and freeze for up to 3 months). Bring a pot of water to a boil over high heat. Working in batches, drop the gnocchi into the boiling water. Cook until the gnocchi rise to the top, about 3 minutes. Use a slotted spoon to remove the gnocchi and place in a dry baking pan or on a piece of parchment paper. Continue until all the gnocchi are cooked and well drained. 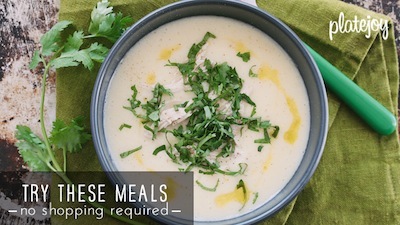 Place 1/4 to 1/2 cup Greek yogurt, lemon zest, and red pepper flakes in a large serving bowl. Stir to combine. Heat 1 Tbsp butter in a large sauté pan or skillet over medium heat and add the broccoli florets to the pan. Turn the heat to medium-high. Cook, tossing frequently, until slightly softened and browned, 6 to 8 minutes. Transfer to the large serving bowl (with yogurt), toss, and then cover with aluminum foil to keep warm. Add another Tbsp butter to the sauté pan and melt over medium heat. Working in batches, add a layer of gnocchi and cook until browned and crispy, 3 to 5 minutes, shaking the pan continuously so the gnocchi don’t stick. Add the cooked gnocchi to the serving bowl with broccoli florets. Repeat until all the gnocchi are pan fired, adding more butter and adjusting heat as needed. Gently toss and serve warm. There’s no better way to say “I love you” then with a handmade cookies filled with little pieces of paper that have those exact words on them. While the shape and sentiment are hugely impressive, these cookies are surprisingly simple to make. So if you except this challenge and take on the task yourself, just sure to only bake and fold two at a time, as they harden really fast. But again, this is a great recipe for an extra pair (or more) of hands. So spread the love and workload, and make this a team event. Preheat oven to 375℉. In a medium bowl, whisk together the dry ingredients. In a separate medium bowl, whisk together the egg whites and vanilla extract and sprinkles (if using). Slowly add the dry ingredients into the wet ingredients, using a fork to whisk until you have a smooth batter. Grease a cookie sheet or use a silpat, and then use a greased-spoon to spread a tablespoon of batter into a 3-inch circle. Only bake two cookies at a time so you have time to mold the cookies before they cool. Bake for about 6 to 7 minutes, until the edges are browned. Then, working quickly, use a spatula to flip a circle over onto your work surface. 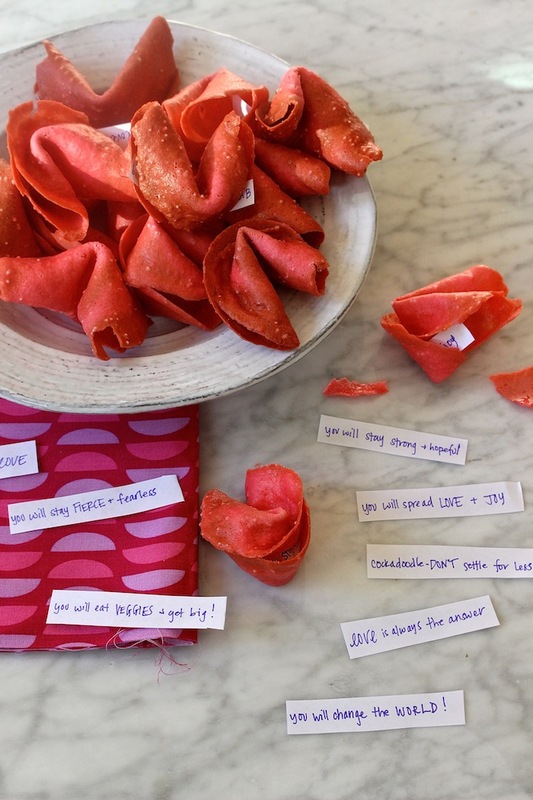 Place a fortune in the center, fold the circle in half, and then pick it up and bend the two ends towards each other to get the fortune cookie shape (or watch this VIDEO!). 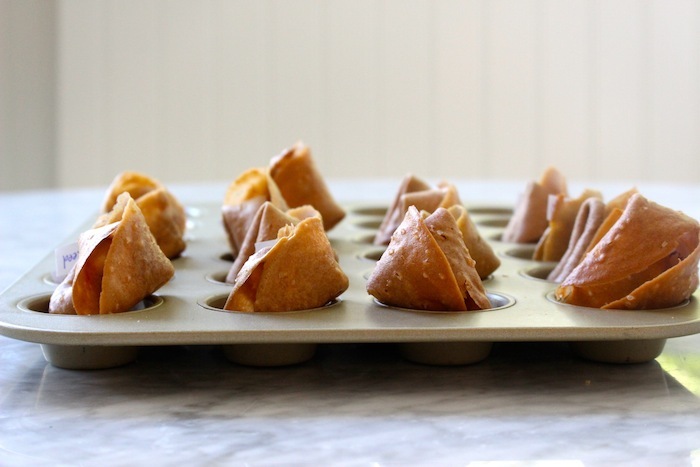 Place folded cookies in a muffin tin so the shape holds while the cookies cool. Repeat, working in batches of 3, until no batter or fortunes remain. Enjoy! Wow this looks amazing! Can’t wait to try this for my wife’s birthday. I really like the personal touch with the fortune cookies. Flash Player 9 is required.